Two stages in the constriction of apical surfaces (blue) of a pair of cells in C. elegans. Constriction of the apical side of cells in an epithelial layer generates enough force initiate invagination. In gastrulation, the apically constricting cells are known as bottle cells. The bottle shape results when constriction of the apical side of the cell squeezes the cytoplasm, thus expanding the basal side. Apical constriction plays a central role in important morphogenetic events in both invertebrates and vertebrates. It is typically the first step in any invagination process and is also important in folding tissues at specified hingepoints. During gastrulation in both invertebrates and vertebrates, apical constriction of a ring of cells leads to blastopore formation. These cells are known as bottle cells, for their eventual shape. 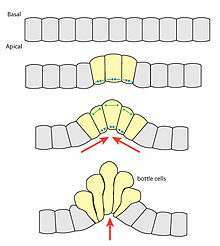 Because all of the cells constrict on the apical side, the epithelial sheet bends convexly on the basal side. In vertebrates, apical constriction plays a role in a range of other morphogenetic processes such neurulation, placode formation, and primitive streak formation. Apical constriction occurs primarily through the contraction of cytoskeletal elements. The specific mechanism depends on the species, the cell type, and the morphogenetic movement. Here, we present a few well-studied examples in model organisms. 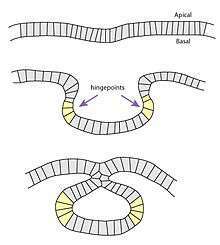 Apical constriction of cells at the hingepoints of neural folds generates forces that participate in neural tube closure. 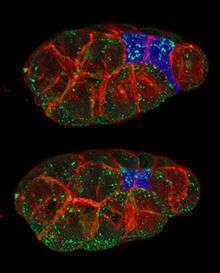 The molecular picture of apical constriction is most complete for Drosophila. During Drosophila gastrulation, apical constriction of midline cells initiates invagination to create the ventral furrow. Like in Xenopus, actomyosin contractility plays a major role in constricting the apical side of the cell. The constricting cells have an actin meshwork directly beneath the apical membrane as well as circumferential actin belts lining the adherens junctions between cells. Pulsed contractions of the actin meshwork are believed to be primarily responsible for reducing the apical surface area. ↑ Lee, J.; Harland, R. M. (2007). "Actomyosin contractility and microtubules drive apical constriction in Xenopus bottle cells". Developmental Biology. 311: 40–52. doi:10.1016/j.ydbio.2007.08.010. ↑ Lee, J.; Harland, R. M. (2010). "Endocytosis Is Required for Efficient Apical Constriction during Xenopus Gastrulation". Current Biology. 20: 253–258. doi:10.1016/j.cub.2009.12.021. ↑ Keller, R (1981). "An Experimental Analysis of the Role of Bottle Cells and the Deep Marginal Zone in Gastrulation". The Journal of Experimental Zoology. 216: 81–101. doi:10.1002/jez.1402160109. ↑ Haigo, S. L.; Hildebrand, J. D.; Harland, R. M.; Wallingford, J. B. (2003). "Shroom Induces Apical Constriction and Is Required for Hingepoint Formation during Neural Tube Closure". Current Biology. 13 (24): 2125–2137. doi:10.1016/j.cub.2003.11.054. ↑ Sawyer, J. M.; Harrell, J. R.; Shemer, G.; Sullivan-brown, J.; Roh-johnson, M.; Goldstein, B.; et al. (2009). "Apical constriction: A cell shape change that can drive morphogenesis". Developmental Biology. 341: 5–19. doi:10.1016/j.ydbio.2009.09.009.